Builder: Swan Hunter, Tyne & Wear, U.K. 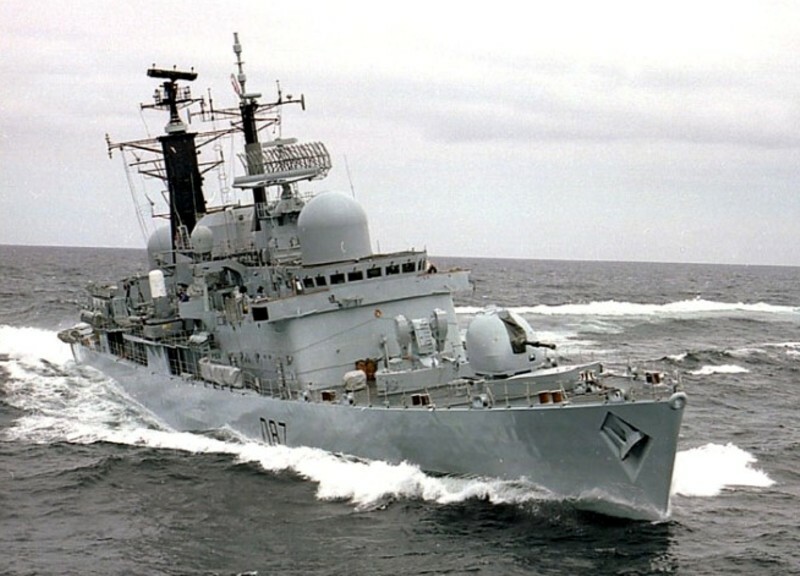 The eighth HMS Newcastle was a batch 1 Type 42 destroyer of the Royal Navy, launched in 1975. Newcastle was decommissioned on 1 February 2005. In November 1997, Newcastle made her way to the Caribbean to assume duties as West Indies guard ship. This deployment was concerned primarily with counter narcotics operations and saw the ship embark a US Coast Guard Law Enforcement Detachment (LEDET) under the command of US Coast Guard District 7 in Miami. Throughout the eight months of the "WIGS" deployment Newcastle rendered assistance to the Governor and people of the British Overseas Territory of Montserrat following a devastating volcanic eruption. Newcastle re-entered Portsmouth Naval Base on 10 July 1998. In 1999, Newcastle escorted the aircraft carrier Invincible during the Kosovo War, in which Invincible launched attacks on Serbian targets. Newcastle took part in six-month Atlantic Patrol Deployment in 2002. During this deployment, she visited Sierra Leone to display the continuing UK commitment to that country. Despite speculation that four Type 42s would be either decommissioned or mothballed, Newcastle deployed to the Mediterranean in January 2004 for a 7-month tour of duty. It was announced in July 2004, as part of the Delivering Security in a Changing World review, that Newcastle would be decommissioned in January 2005. Newcastle was decommissioned on 1 February 2005 and placed into inactive reserve. Whilst sitting out at Fareham Creek she was cannibalised heavily to keep the remaining Type 42 destroyers running. On 21 November 2008 Newcastle left Portsmouth for the last time for Aliağa, Turkey under tow of the tug Lore. Demolition took place in the same yard which was scrapping Tuxedo Princess, a former ferry and floating nightclub that had been berthed underneath the Tyne Bridge.